All Saint's day or also called All Hallows Day is celebrated by some on November 1st but many in the eastern church celebrate the day on first Sunday after Pentecost. 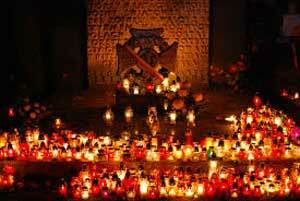 The day celebrates all the Christian saints, especially saints that do not have their own holiday. Christians will attend church and make offerings and some will put flowers on their dead relatives graves. This day is a national holiday with government and most business offices closed. This holiday started when the Greek Christians kept a festival on the first Sunday after Pentecost which celebrates all martyrs and saints. Pope Gregory IV officially made it a holiday and changed the named to all saints day.